This photograph shows the "line" between the Grinnell Glacier and Upper Grinnell Lake. Additionally, you can also see the Salamander Glacier. This glacier was actually part of the Grinnell Glacier many years ago. 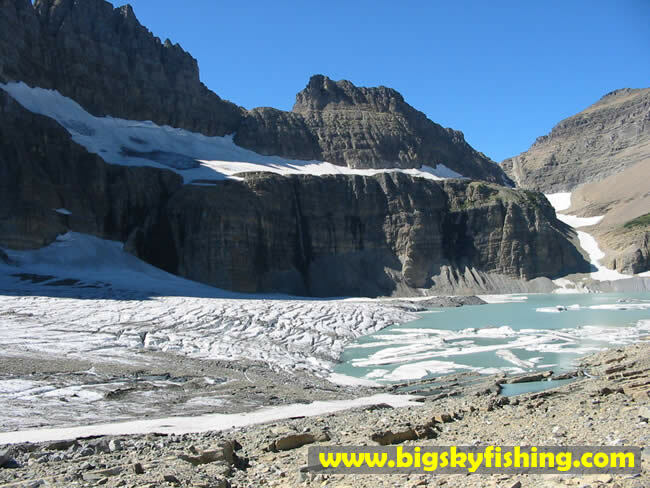 However, the rapid meltiing of the Grinnell Glacier Trail caused the glacier to split - so instead of one big glacier you now have two smaller ones. Additionally, if you look closely at the Salamander Glacier you can see some "bare" spots forming in the middle of parts of it. I suspect the Salamander Glacier, despite better protection from the sun, will probably completely melt away before the Grinnell Glacier does due to its smaller size.